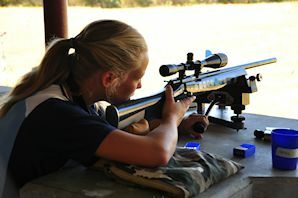 Members can obtain Nationals colours (Protea colours) in the class) This class has a weight restriction on the rifle on max 4.76 kg and not more than 12 ft-lb of energy. There is no limit on scope magnification. Distance to target is 25m. The objective is to shoot 25 targets in 20 minutes. The inner target / circle diameter is 2mm. 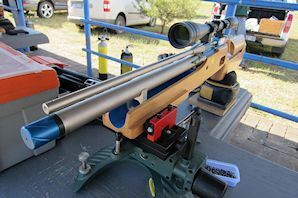 Members can obtain Nationals colours (Protea colours) in the class) Very similar to the Light varmint class except that the weight of the rifle is maximum 6.8 kg and maximum 20 ft-lb of energy.There is no limit on scope magnification. Distance to target is 25m. The objective is to shoot 25 targets in 20 minutes. The inner target / circle diameter is 2mm. Members can obtain Nationals colours (Protea colours) in the class) This is a 50m score shoot class. Max scope magnification is 6.5x. You have 30 minutes to complete 25 scoring shots. See the rules for more information regarding rifle limitations. 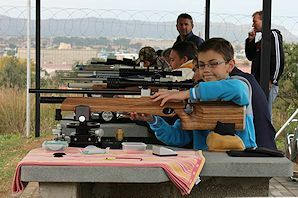 Members can obtain Nationals colours (Protea colours) in the class) This is a 50m score shoot class. 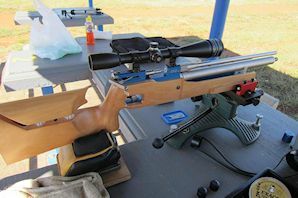 Scope magnification is unlimited, but the rifle has a weight limit of 4.76 kg. See the rules for more information regarding rifle limitations. 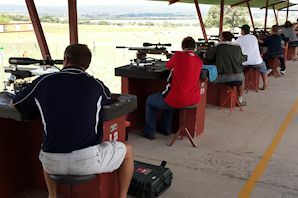 Members can obtain Nationals colours (Protea colours) in the class) This is a 50m score shoot class. Scope magnification is unlimited, but the rifle has a weight limit of 6.8 kg. See the rules for more information regarding rifle limitations.